Handpicked American Style Cruisers direct from the USA registered and ready to ride in Europe. See the latest stock available on the website americancruiseruk.com. Bill Bunn Motorcycles was established in 1964. A family run business offering the highest levels of customer service and mechanical experience. All Motorcycles come with a 6 month warranty under go a 30 point check and come with a new MOT as well as being serviced before collection. 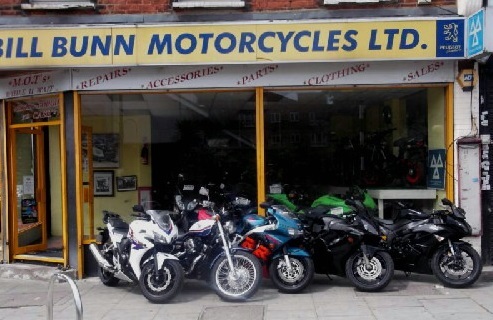 Bill Bunn also offer servicing MOT tests and supply and fit new tyres at competitive prices, as well as a full range of Motorcycle clothing and accessories. We are specialist importers of pre-loved, quality German factory built Trikes. Our main manufacturers tend to be Rewaco and Boom Trikes...but we can source any Trike for you from our extensive network of suppliers throughout Europe. Check out our latest stock here at Our Website . Established in 1982, we've a wealth of experience in the motorcycle and scooter trade. We provide a range of sales services to help you select and finance the right bike for you. We also offer the assurance of an extensive range of aftercare services backed up by factory trained technicians with the aim of ensuring you have a positive ownership experience. Leather or synthetic leather motorcycle saddlebags with click & lock system. These sets aere available for most popular cruisers of Harley, Honda, Suzuki, Kawasaki, Yamaha & Triumph.